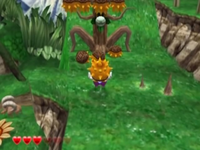 A Tree Freak is an enemy in Wario World that appears in Beanstalk Way. Tree Freaks are massive trees with green leaves and spiky fruits growing on their branches. When Wario ground-pounds near the tree, it will shake the ground and cause the tree to drop its fruit. Wario must pick up the fruit on the spikeless side and chuck them at the tree's weak spot; a small bud on the front of the tree. Wario must fight three Tree Freaks during the level. The first Tree Freak at the beginning takes one hit to defeat, the second in the middle takes two hits, and the one that takes three hits is at the end. 1 Ore Dayo! Wario Dayo!! Tree Freak appears in chapter 7 of the first volume of Ore Dayo! Wario Dayo!!. In the chapter, Nekkoro notices Tree Freak under the black jewel's spell. After the black jewel frees Tree Freak from the spell, Nekkoro notices Tree Freak's bandages from when it got hurt. Wario sprays urine to put out the fire Tree Freak got caught in. However, it destroys Tree Freak, but Nokki 2 sprouts. Wario soon sprays urine on Nokki 2, hoping for it to grow. ↑ Stratton, Steve. Wario World Prima Official Strategy Guide. Page 77. This page was last edited on January 14, 2019, at 21:02.